So the internet is awash with rumours and leaks about next years Avengers 4! Now take all this with a pinch of salt most of these rumours come from various sources on Reddit. * Ant Man escapes the quantum realm by using a quantum time portal , he finds Hank Pym and they both create a quantum device that allows them to time travel. He goes to the current time to join the remaining avengers. * The remaining Avengers go back in time (I think using the time device) to get the Infinity Stones before Thanos gets them. * They get past and maybe future versions of themselves and those that got wiped out to battle Thanos. * They defeat Thanos and Tony Stark somehow absorbs the infinity stones and transforms into Eternity! 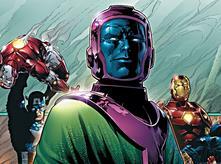 * Kang shows up at some point (Kang’s real name is Nathaniel Richards a relative of Read Richards , could be a way of introducing the FF) and battles the Avengers! Captain Marvel gets involved but we all knew that !! There’s loads of versions of these rumours but myself I’ll be keeping an eye on Avengers 8 and Strange Tales 138 , but lets see what happens !